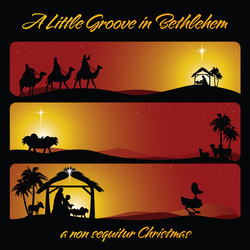 A Little Groove in Bethlehem - available now on iTunes! "A Little Groove in Bethlehem" is not your average Christmas album. Released November 22nd, 2011 by Non Sequitur, the record runs the gamut from hard rock to funk to jazz, capturing your holiday favorites in ways you've never heard them before, played by award winning musicians. "Like" the band on Facebook.com, and watch out for Sam and his cow suit. Sample Track on YouTube - Check it Out Below!